Grey Mens Overcoat With Fur by James Calehan. This grey mens overcoat is a luxe runway-inspired favorite as seen on celebs, like Jamie Dornan and Kanye West. Featuring rich grey tweed texture with removable faux fur collar. Constructed with double-breasted front with four-button accents, side welt pockets and single vent. Grey mens overcoat includes fully lined interior with two internal pockets. A sophisticated coat designed to be worn open, like a blazer. A fashion forward yet functional must-have winter item. Easily transition from office casual to evening chic in the grey mens overcoat. 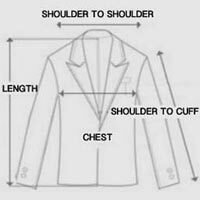 No buttonholes included - coat does not close.